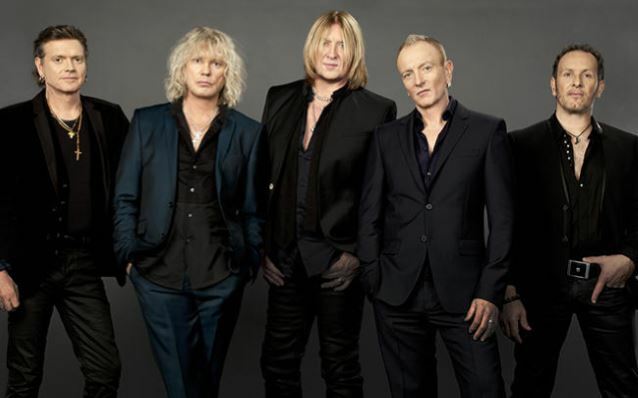 DEF LEPPARD has released a ten-second video teaser for its forthcoming self-titled album. Check it out below. DEF LEPPARD singer Joe Elliott told North Dakota's Grand Forks Herald that the band's new disc is just called "Def Leppard" "because that's what it sounds like. It doesn't sound like any one specific era of DEF LEPPARD. It's got everything. You'll listen and you go, 'Oh, that sounds like DEF LEPPARD,' or you'll go, 'That is LEPPARD, but it sounds a bit like LED ZEPPELIN or QUEEN but you can hear the AC/DC or the CROSBY, STILLS & NASH coming through.' We have not shied away from anything that's influenced us in our growing up periods of our life. Just because we've made the kind of music we've made doesn't mean to say we don't like all of this other stuff." The album contains 14 songs and clocks in at 55 minutes. Elliott says he and his bandmates doing some last-minute work on it and plan to release it in October. It is the group's first studio effort since "Songs From the Sparkle Lounge" in 2008. Although DEF LEPPARD is one of the great success stories in rock history, Elliott doesn't kid himself into thinking the band was built to last forever, admitting: "When you've been together for 35 years, we could split up in 20 minutes as soon as I finish this phone call because that could have happened in our last 20 years, but it didn't. We're realistic to realize that it all comes to a sticky end one day. Nothing ever ends well. When did you ever hear of a band who was having massive success and then saying goodbye to each other with a smile on their face?... We're really lucky — four members of this five-man group have been together for 32 years and this current lineup has been together for 23." DEF LEPPARD is currently touring North America with STYX and TESLA.